Archivists and conservators in their native habitat. Sometimes records turn up in the oddest of places. The survival of some of the records now safely stored at Warwickshire County Record Office has been by mere fluke, when someone has spotted something that may be of historical interest just in the nick of time. We’ve had deposits of records that have been found in greenhouses, walled up cellars, and even found stuffed into window or chimney recesses. Other collections have been neglected and left in suitcases in barns for many years. More often than not, it is not only time that takes its toll on records. Water and fire are two obvious ones, but if records have been left in unsuitable conditions, biological hazards also pose a threat – mould can thrive on records and insects and rodents find them either a tasty snack or suitable nesting material. At the time, the records probably didn’t seem that important – just the run of the mill items that were taken for granted as part of day to day life. Today, however, these records provide a snapshot of life at that time and therefore we take the decision to make steps to ensure their survival into the future. 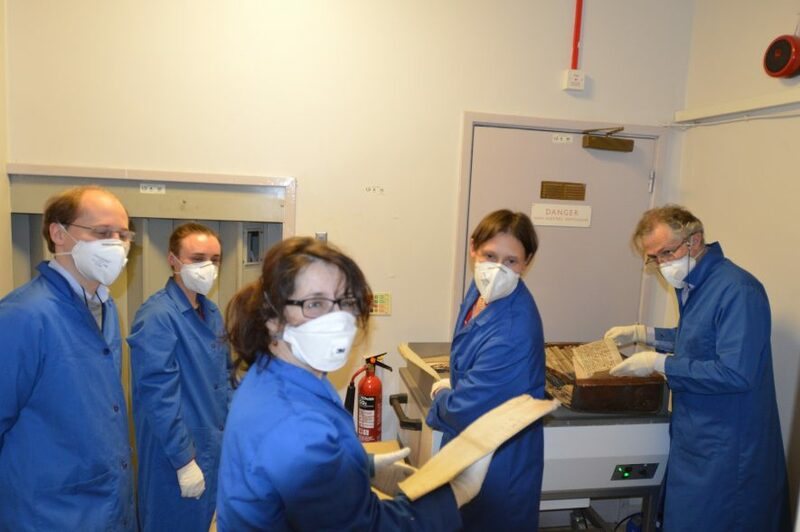 Archivists and conservators to the rescue! So when these records are discovered by someone who has an inkling of their worth and contacts the record office, it can be all hands on deck for our archivist and conservation teams! If there is a risk of mould or insect infestation, we need to make sure that this is dealt with as soon as possible to ensure their survival as well as to ensure that our current collections are not contaminated. More often than not, the records end up on our mould machine which takes away potentially harmful mould spores. As such, full protective gear – dust masks, coats and gloves – must be worn. Once we have tackled any mould or insect problems, the records can either be catalogued or given further conservation work to make sure that they are accessible to researchers. It may not be the most glamourous aspect of working in an archive – and one of the most time consuming, but in many ways it is one of the most fulfilling, rescuing those pieces of history that very nearly never made it.